Wash the red gilt-head and pat dry. Finely slice scallions. Wash the bok choy and pluck the leaves. Cut the lemon into wedges. Finely chop ginger and garlic. Deseed chili and finely slice. Stuff lemon wedges inside the fish cavity, followed by some of the garlic and ginger. Reserving remaining lemon wedges for serving. To make the sauce, heat sesame oil in a frying pan. Add remaining garlic, remaining ginger, chili, and sauté briefly until fragrant. Deglaze with water and soy sauce, then add sugar to the pan. Stir well. Line a steamer basket with baking paper. Put the fish in the steamer basket, set over the boiling water to steam. After approx. 5 min, add bok choy leaves to the basket, let steam for approx. 5 min more. 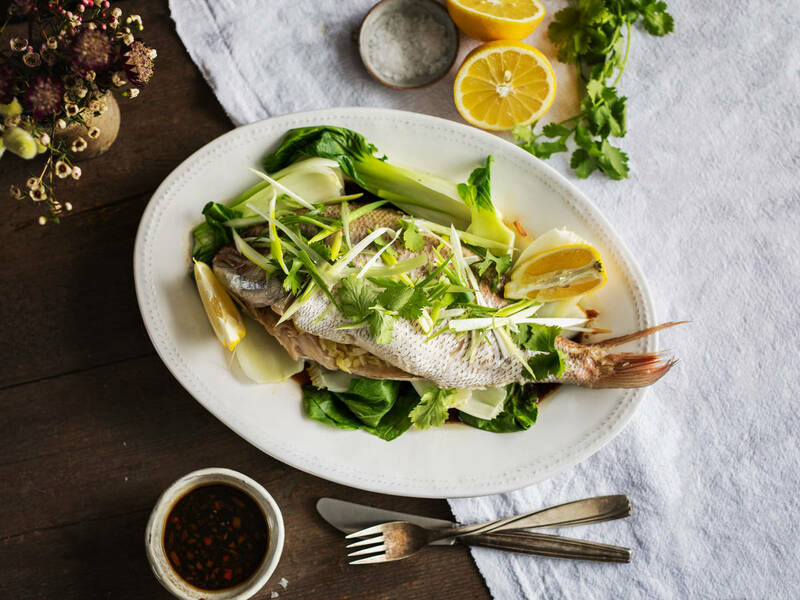 Serve the steamed fish and bok choy in a plate. Pour the ginger-garlic sauce over the top and garnish with sliced scallion, cilantro, and lemon wedges, if desired. Serve with rice. Enjoy!